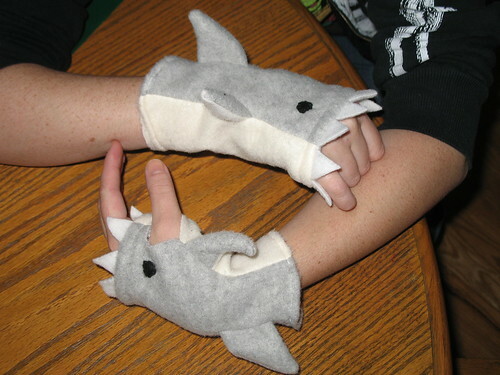 Somehow I ended up at a page on etsy.com that had fingerless shark gloves. 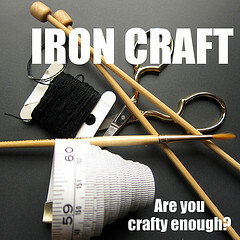 Go to etsy and check these ones out for a killer comparison. I really like the idea of gloves as different animals, and sharks are brilliant for it, but I wasn’t impressed with the execution. I just don’t see the shark in them. It’s a little too creative of an interpretation for me. 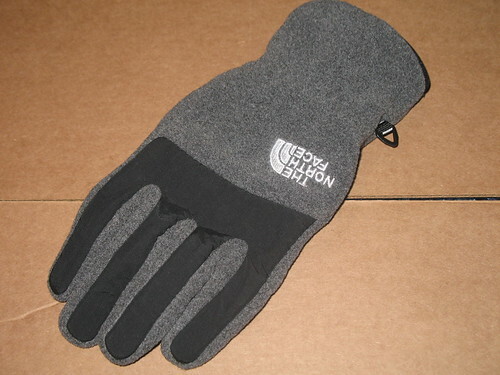 I also think that there shouldn’t be any felt used on gloves because gloves need to be washed regularly. 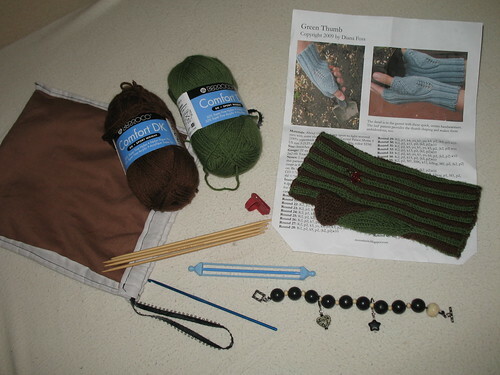 I decided that night that I should sew some shark gloves because I wanted a pair, and I wanted something very different from what was being offered. 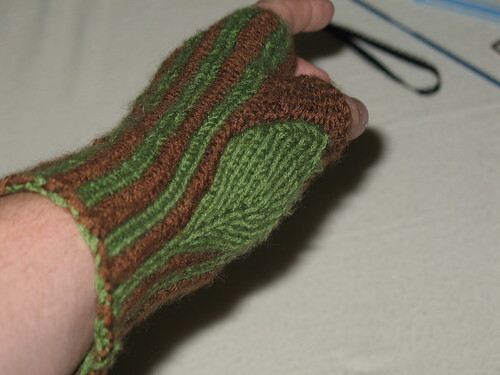 I made a pattern by tracing my hands and adding to it to get the right thickness. They came out just a little too big, but not bad for my first try. I’ve also decided I need a nice pair of fabric pinking shears. It’s a good Christmas idea if you need to shop for me. It’ll help make more realistic shark teeth in addition to other things. The coolest part of the gloves may be the fins, but having the color be lighter on the bottom just like a real shark is pretty cool too. 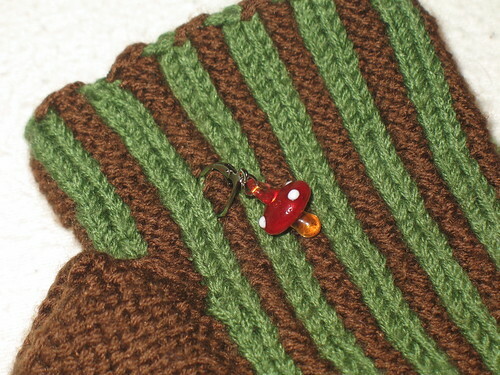 I’ve considered adding gills, but I have yet to come up with a way to stitch them on so they look good. 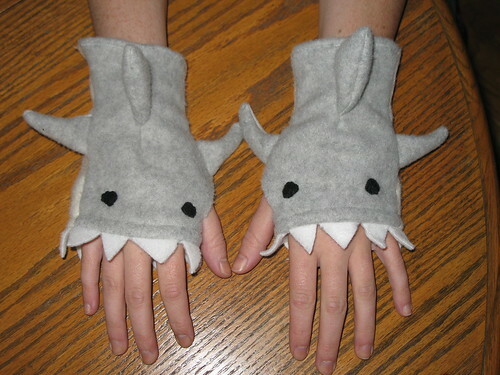 The reason these shark gloves are so cool is because they remind me of my grandpa. He used to use this shark puppet that I have as a tickle monster. It’s very similar looking and has smaller teeth and a pink mouth. 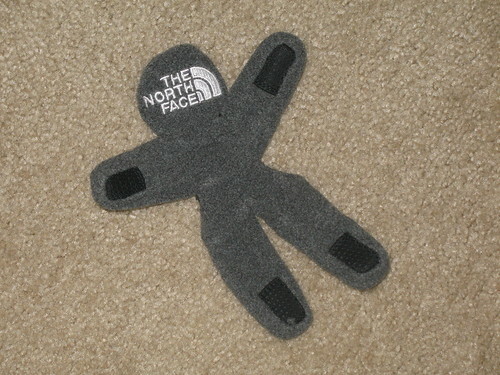 It’s made of a very short fur fabric. I love it, but it’s just too beat up and special for every day use. These washable fleece sharkies are perfect for every day wear and you can evey drive, shop, or attend class in them since you don’t lose any hand function like you do in a shark hand puppet. It was even a nasty cold day out to give me a god excuse to wear them out and about to class and physical therapy! It’s going to be a good winter if I get to wear these all over. 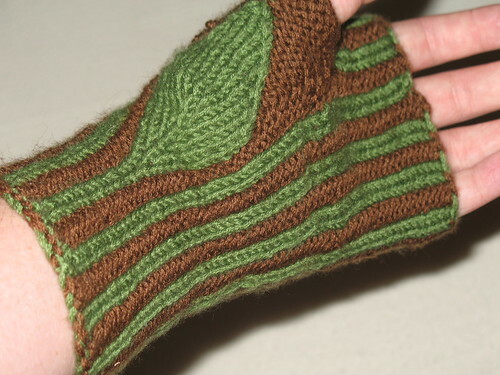 I’m contemplating making some panda gloves for myself and I’m gusesing some of my friends will want other critters like monkeys as gifts.